You must have a reservation to pickup. Detailed maps and directions to the Colombo pick-up location and local phone numbers of the rental office will be e-mailed to you after the reservation is made. For immediate assistance, you may contact any one of our Kapruka office locations. How do I get to the pick up location from the Colombo International Airport? You could take a taxi from the airport to our pick up location. The address and the contact numbers of the Colombo rental office will be e-mailed to you. Yes. We offer airport pickups from Colombo International Airport. When you make your online reservation, you will see a place to request airport pickup. A US$48.00 charge will be added for this service. Do you offer automatic transmission cars? Do I need a Sri Lankan Driver's License to rent? You may use any International Driver's licence if you don't have your Sri Lankan licence. But it has to be endorsed by the Automobile Association of Sri Lanka. Also, you may use a driver's licence issued by your country, and that has to be endorsed by the Registrat of Motor Vehicles, whose office is located at Werahera - 18 Kms. from Colombo city. These offices are opened on weekdays from 9.00 to 2.00 pm. Our rental office will give you instructions on how to get there and endorse foreign licence. Do I need to make a refundable deposit? Yes. You will be required to make a Rs 15,000 to Rs 25,000 fully refundable deposit depending on the type of vehicle you choose. You should pay this deposit in any currency at the rental office when you pick up your vehicle. The exact required deposit amount for your selection will be shown on the order preview page and on the confirmation e-mails we send you. Where is your pick up location? 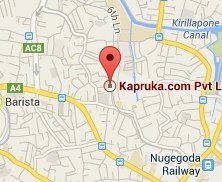 The rental office is located in Nugegoda. You will receive the phone numbers and directions to the rental office once you make your reservation. What documents do I need to bring when I pick up the vehicle? You will need to bring in your Passport OR National ID card and a copy of the Kapruka reservation confirmation e-mail when you come to pick up your vehicle. I want to make the reservation for couple of months, Can I do that? We make your reservations only upto 4 weeks, but your reservation is extendable. You may arrange an extension to your reservation at the time you pick up the vehicle. You will be offered the same or cheaper rates at the rental office when you extend a reservation. Do I get unlimited mileage with my car rental? There is a 90Km per day limit. Which means if you rent for a week, you have 630 km. This limit is plenty for any average user. If you are running over that limit there will be an additional charge. Additional charge varies depending on the vehicle (Average is Rs 25 per Km). Can I cancel my reservations? Yes, you may cancel your reservation by contacting us at least 3 business days before the pick up date. Cancellation fee is US$20.00. Can I get a cell phone with my car? We can not provide a cell phone. You can get a to-go cell phone at the Bandaranayaka International Airport's arrival wing from Mobitel or Dialog GSM sales booths. Can I get baby booster seats with my car? Sorry we do not provide baby boosters. You may buy these from several outlets in Sri Lanka. The rental pickup office will be able to give you guidance on where to get baby items, including booster seats. Can I change my reservations details? If you wish to do any changes to your reservation please contact our central office in USA. Changes can not be guaranteed, but we will certainly try to help you. I have more questions, How do I contact Kapruka?